Completing a Full Marathon (26.2mi) is a life-changing event. A marathon finisher’s medal is a symbol of dedication, hard work, and the accomplishment of a challenging goal. Participants in our 16-week program benefit from our professional head coaches, experienced mentors, well-managed group runs on the St. Louis area’s best paths, access to an extensive lineup of health care professionals, and informational clinics on nutrition, hydration, gear, injury prevention, stretching techniques, and more. Additional perks are available for those who choose to fundraise for St. Jude Children Research Hospital. Our Finish program is appropriate for anyone who wants to enjoy training to run 26.2 miles between 3 hours (8:00/mile long run training pace) and 5¼ hours (13:00/mile long run training pace). We welcome first-time marathoners and veterans looking for a structured program that will prepare them to run a personal best. This program will prepare participants for any goal marathon occurring between early April and early May. If you are an experience marathoner looking to transition from completing to competing a marathon, visit the 26.2mi Fast Program. Individualized training in a group setting. Our proven program has served more than 3200 marathoners. Over the past nine years, participants have given the program an average rating of 4.8 stars (out of five) and more than 90% have completed their goal race. Our program is appropriate for both first-time marathoners and experienced veterans. Experienced, professional head coaching. Our degreed and credentialed head coaches assess each participant's current fitness level and goals and ensure that they train at an appropriate level. Mentors who have completed over 500 marathons. Experienced mentors offer support and motivation to athletes in long run pace groups ranging from 8:00/mile to 13:00/mile (walk/run) and following customized novice, intermediate, and advanced schedules. Two weekly group workouts. The Fleet Feet Running Club guides both the fast and slow weekly workouts - Tuesday track workouts at Parkway Northeast Middle School starting at 6:30pm and Sunday long runs at various locations starting at 7:30am. A chance to be a hero. 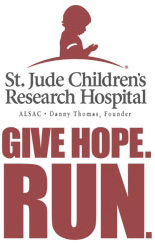 Our partnership with St. Jude Children's research hospital gives team members the opportunity to run for the kids. Tuesday evenings, 6:30pm, at Parkway Northeast Middle School for SPEEDWORK. Saturday mornings, 7:30am on a variety of paths in St. Louis' lively running community (aka, we will visit a different beautiful park each week) for LONG RUN OR WALKS. The program begins with a formal meeting (run to follow) on Saturday, January 5th, 2019 starting at 7:30am at our Des Peres location. "Just wanted to give a little shout out to the amazing Fleet Feet family and my awesome pace coach! I PR'd on my marathon today, and all the support meant so much!" – L.K. "To the excellent Fleet Feet coaches who all helped me achieve something that just four months ago I wasn't sure was possible. I want to say THANK YOU!" – M.K. "Thank you to all the Fleet Feet coaches for their dedication. I have just signed up for my fourth marathon training program. I just can’t get enough." – K.S. "I thought qualifying for Boston was an elusive dream until I started training with the Advanced Fleet Feet marathon group. Now it is a reality! Thanks Fleet Feet." – J.L. If you have any questions that aren't answered on this webpage, please click here to email us.